I was wondering what folks experience with the fuel gauge and the fuel range was like?. On the last two fills I have ran the Jimny until it drops to one bar. When dropping to one bar the range drops to -- and the fuel warning light comes on. At that point I head off to find a petrol station. Maybe do another 5 miles or so. When refuelling I have only been able to add 31 litres. Now the tank is supposed to be 40 so warning light and fuel range zero appears to take place when I still have 9 litres of fuel. With my current mpg of around 40 I should still have 75 to 80 miles of range. I have not as yet put this to the test as when I see fuel range of -- I go and top up. Do I have a miscalibrated fuel gauge or have you experienced the same thing? Replied by Hanslow on topic Gen 4 and the Fuel Gauge/Range Indicator? Same poor range estimation on mine. I did a short six mile journey and ended up with more estimated mileage left than when I started. I wish it was like that all the time as I could then travel around for free! I've never liked letting my cars drop low so I've more than often filled up before the light has come on. I'm too risk adverse. Replied by Cremator1 on topic Gen 4 and the Fuel Gauge/Range Indicator? Replied by JodieMarie22 on topic Gen 4 and the Fuel Gauge/Range Indicator? Replied by Lambert on topic Gen 4 and the Fuel Gauge/Range Indicator? The most I have ever put in Ermintrude was 38 litre and that was twitchy bum time. I was on the North Coast of Scotland on a Sunday in November and panicking as I had had to go past 2 stations that were closed and was out of options. Replied by G-imny on topic Gen 4 and the Fuel Gauge/Range Indicator? I put 32 litres in after filling up when the light came on and I am averaging 36mpg in my Auto. I find that the 3 last bars of the gauge tend to only last about 25 miles each. I think your estimate is probably right but I’m not brave enough to do more than 25 miles with the fuel light on. Replied by Soeley on topic Gen 4 and the Fuel Gauge/Range Indicator? You are correct, I average 43 mpg, so when the fuel light comes on I bank on another 70 miles to go. I then zero Trip B and drive 60 to 70 miles before filling up. Even then I have still had 2 to 3 ltrs spare. Replied by wjamieson on topic Gen 4 and the Fuel Gauge/Range Indicator? Not just me then. Thanks for all the comments. Replied by GeorgeC on topic Gen 4 and the Fuel Gauge/Range Indicator? 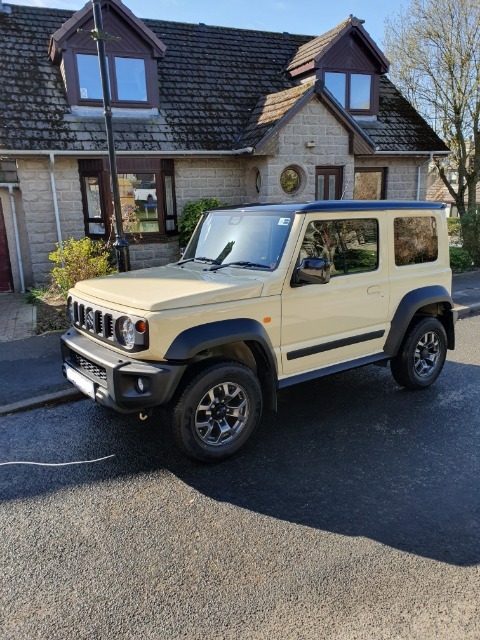 I have an entry on Fuelly: www.fuelly.com/car/suzuki/jimny/2019 but no consumption recorded just yet. Soeley is there, with stats. Please, if more join we will get a better average. I logged 8 years of fuel use there for my 2011 AVEO. I had a shock when I clicked the link then, but the default setting is US gallons not UK.